Day 1: Get out of Texas! 665.4 miles. Temps 68-83F, Partly cloudy with some rain. 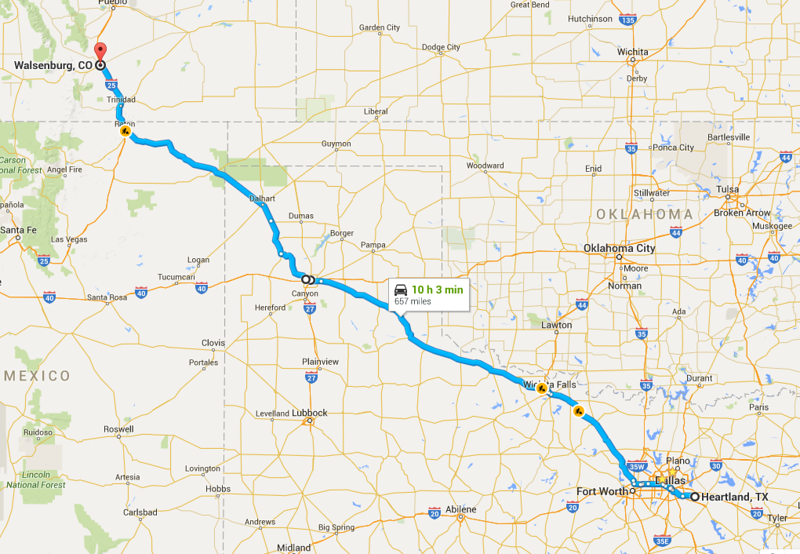 This is how most motorcycle trips start when you live in Texas. Getting across the boring straight flat parts to get to the fun bits. I got up bright and early to leave at 5am get a good start for an earlyish arrival at my destination, which will help me to beat the heat and get through the DFW MetroMess before Tuesday traffic starts. Oddly, traffic was still pretty decent but we were all moving at a pretty good clip through town. Before I knew it I was passing the Texas Motor Speedway and out in the middle of nowhere. 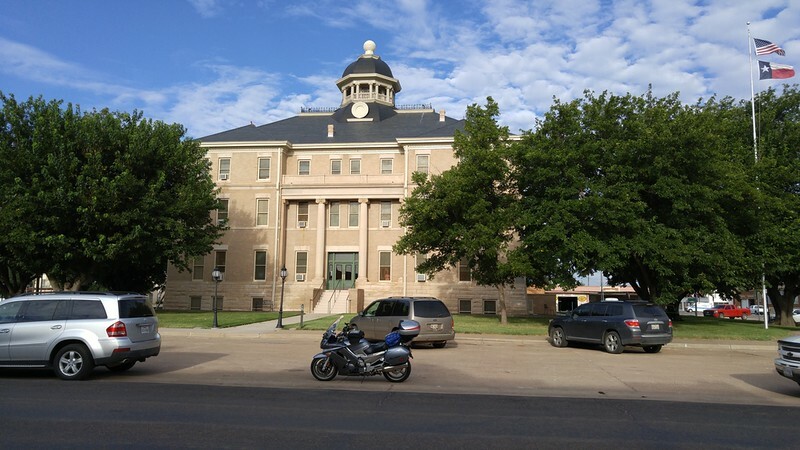 I recently started up the Texas County Courthouse tour, and saw that many were along my route, some even on the actual route, a few a block or so off the route and one less than a mile out of my way. I decided I'd pass this long day by snagging some pictures, which would also give me time to walk around and stretch a bit. This day had originally been planned as a long half day ride, but with me now able to give it a full day and starting early, I was able to slow down and take my time. No rush today. 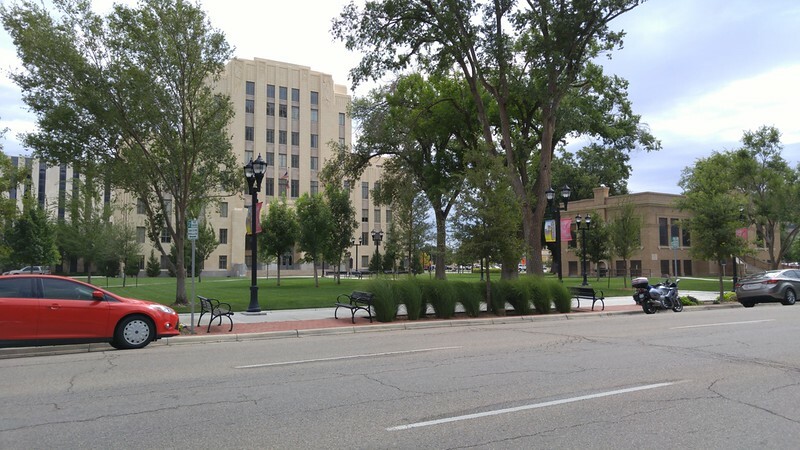 A few of the more interesting courthouses. I ended up skipping the first few courthouses because it was still dark and they, being close to Dallas, I can snag later. However, I did pull off for the first one just to see it. Saw my first cop of the trip. He was sitting right inside the town limits between the 45mph sign and the 35mph sign. As habit, I freaked and looked down at my speedo to see if we were going to get to talk to each other. 36mph and I haven't even passed the 45, I'm good, he'll have to be lonely this morning. The early start also meant I'd be more on my way before the hotter part of the day, and this worked out to my advantage. Highest temps I saw today was 83F, and lowest was 68F. 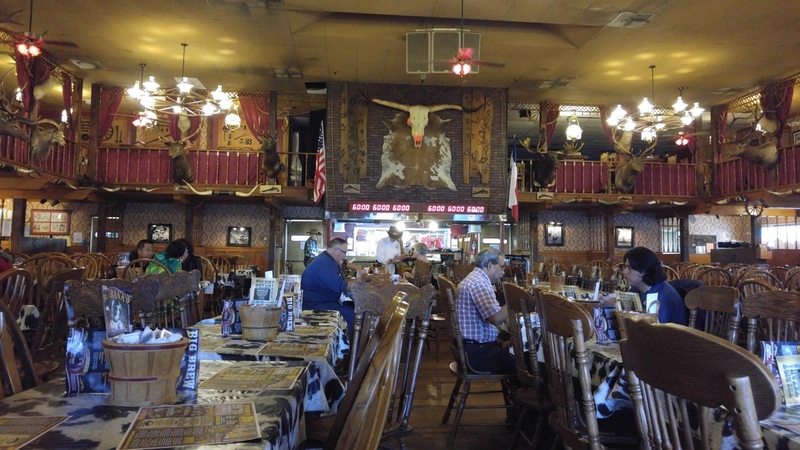 Weather was good till lunchtime when I rolled into the Big Texan in Amarillo. If you aren't familiar with the place, it's pretty much the place that started all of the food challenges with their 72oz steak challenge. 60 minutes to eat a 72oz steak and all the sides. No thanks. I've avoided this place because to me, for someone living in Texas, it's like a Floridian going to Gatorland. You just don't do it. 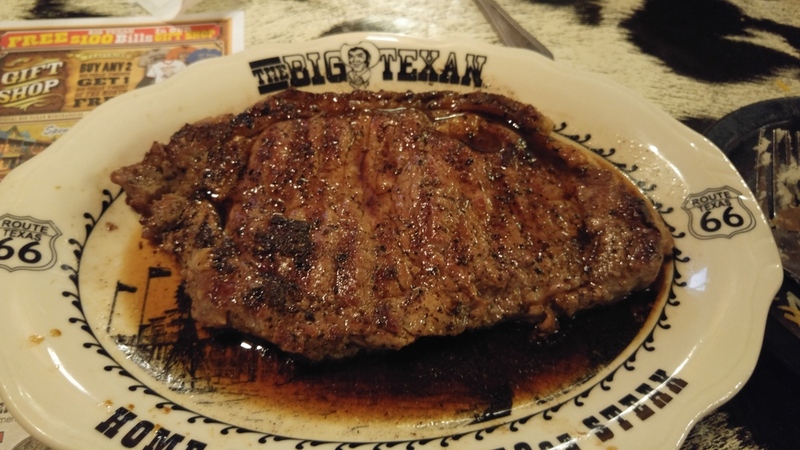 But I've heard good things (from non-Texan folks) about the steaks so I decided to stop in and check it out, plus it was lunchtime and I was hungry. Oh, and it was sprinkling so I'd get a good chance to take a look at the weather radar here and see what's in store for me. I had steak, baked potato and salad. All were good and tasty and hit the spot. 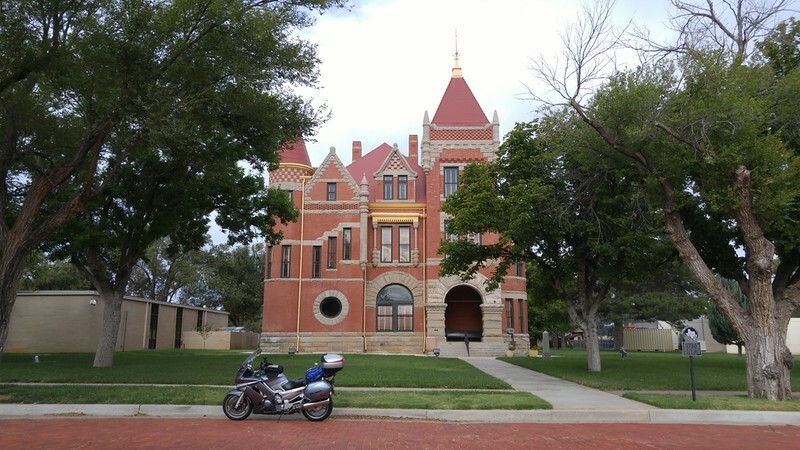 On my way out, I hit the courthouse in Amarillo and then followed my GPS out of town. 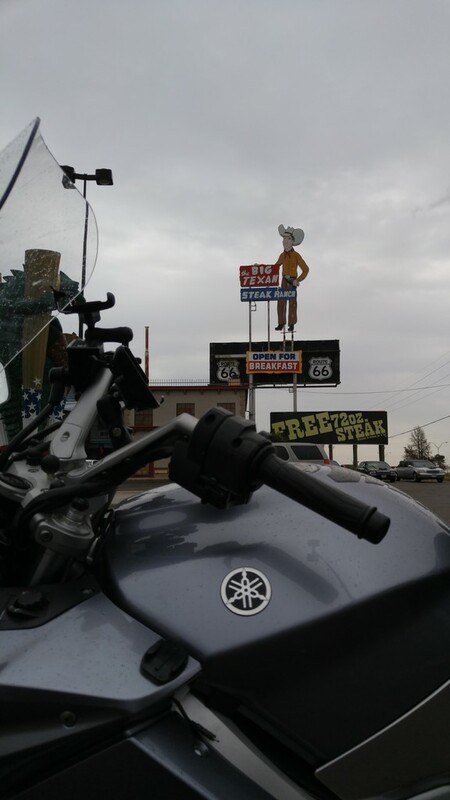 I took 1061 to the northwest and the scenery on the west side of Amarillo is so different from what I'd been riding. So to apparently was the speed of travel. Speed limit was 70mph and I was cruising at 90mph behind another car when out of nowhere we both got passed like we were standing still. First pass was a Dodge Challenger, but the second pass was a high speed minivan doing well into the triples. We got passed like that a few times. On the way I kept watching the thunderstorms off in the distance. 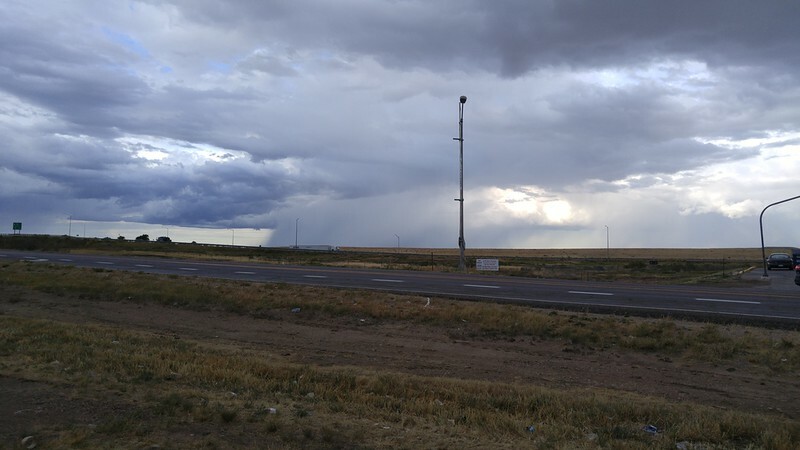 Watching the rain fall on the plains is kind of neat since you can see for so far and see the storms, unless you are on a motorcycle, and then you are trying to figure out which ones you are going to hit. I was watching a particularly nasty one off to my left that I knew to be tracking northeast based on my earlier radar viewing. It looked like i'd miss it until the road began to turn to the left. Sure enough, the road and storm decided to intersect at the time of my arrival at that point. It was a gullywasher, with very limited visibility, and I'm pretty sure contained some very small hail. The sound of the rain on my helmet was completely different from rain I've experienced before or since. I had a brief moment of worry thinking I should pull off and find shelter. I then laughed out loud inside my helmet in a thunderstorm because I remembered that I'm in the plains and there's no shelter for miles and miles. Sure, if there's a tornado I can jump in the ditch, but nothing to shield me from any hail, so better to press on and get through the storm than sit around in it. I popped through about ten minutes later and saw clear skies ahead. I stopped in Texline for gas, caffeine and a snack. While I was there an HD rider pulled in and stopped at the pumps. He came over and we chatted for a bit. He'd been through the same storm right after me. 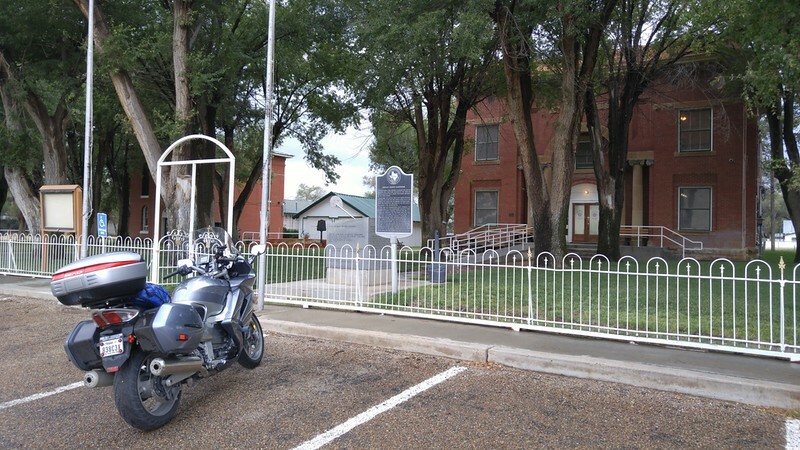 He was riding from the area of Lawton OK to Colorado on his 1972 Shovelhead HD. I have to admit being impressed. That's a heck of a trip on a bike older than I am. 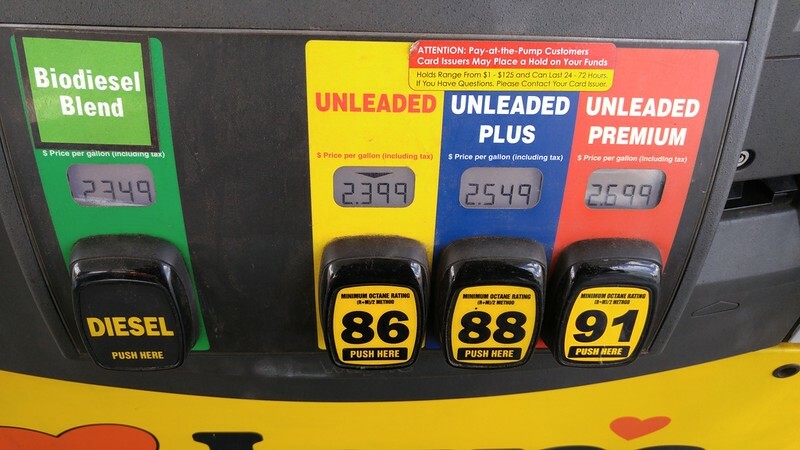 Having started out with gas prices at about $1.90 per gallon in Dallas, and having seen as low as $1.79, I was a little shocked at the prices near the Texas/New Mexico border. Take note, this comes into play later in the story. 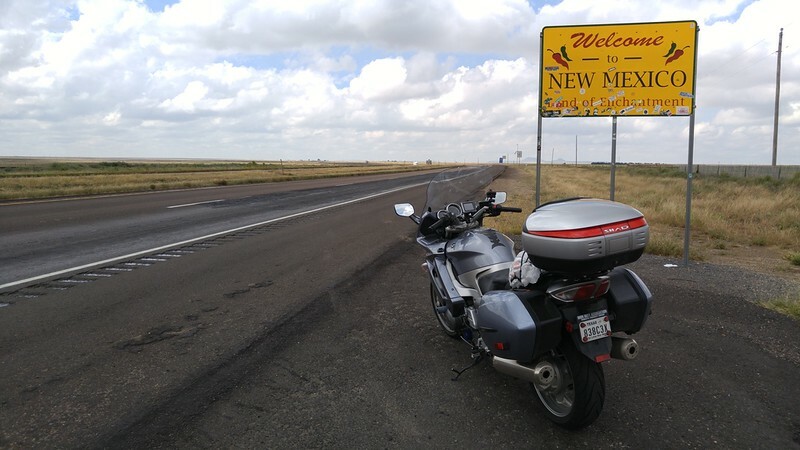 I've been to NM on my bike before, but never managed to get the picture, so I stopped this day. The rest of the trip was fairly uneventful. Passing through the plains of Colorado the road teased me a bit with a passing nasty thunderstorm. The road would point away from it, then turn toward it, then turn away again. I ended up passing just on the front edge and catching the sprinkles. I don't think the HD guy behind me would be so lucky. I hit 25 and the ride through Raton pass was the usual tease of what is to come. I usually go up and over that with a huge grin on my face and this time was no different. Hit some rain coming up 25 but it was just steady rain, not too hard. I passed an HD rider taking cover under an overpass, I waved as I continued on by. 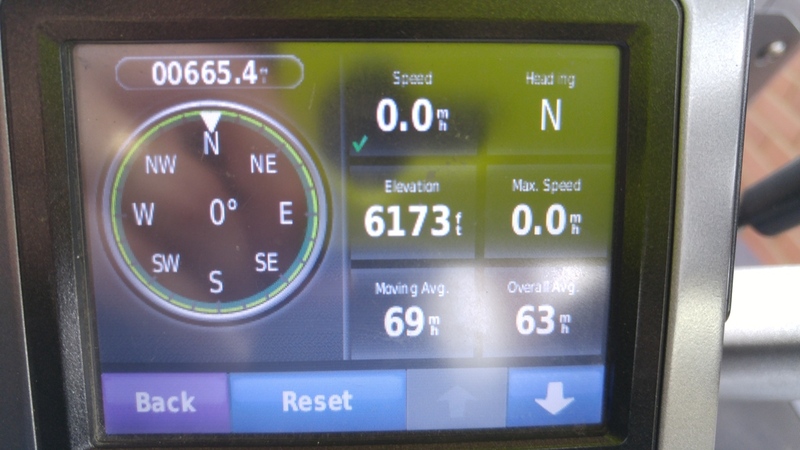 Day 1 ended after 665.4 miles at the Best Western Rambler in Walsenberg Co. 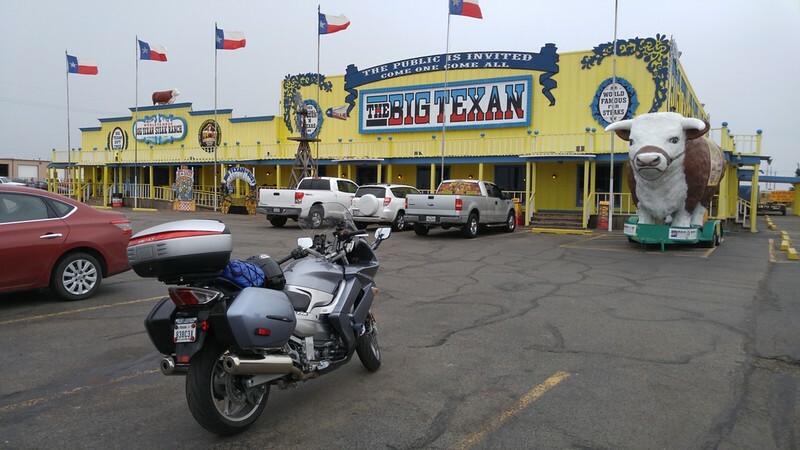 This is an amazing place for motorcyclists to stay. I asked the lady if I could leave my bike out front under the overhang. She agreed and also offered me an "Exterior" room if I wanted. I wasn't sure what she meant but figured I didn't want to move the bike and since it was under cover, it'd be better for unloading and loading right there with the rain. Turns out, they have some other buildings on the property where you can park right in front of your door. Great stuff and a great stay. 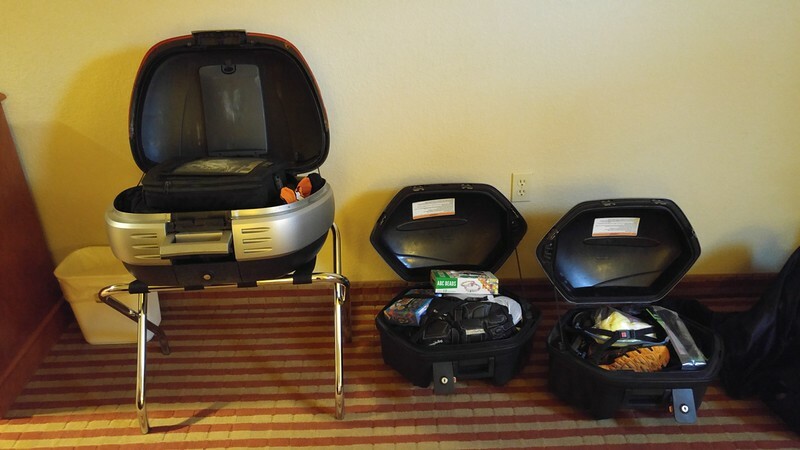 Oh yea, hard detachable luggage rocks for hotelling. GPS final for the day. Fun fact of the day. I've climbed Mt Washington in New Hampshire, the highest peak in the Northeastern United States. The summit is 6,288 ft above sea level. In this photo, I'm technically still in the plains with the foothills of the Rockies right behind me.